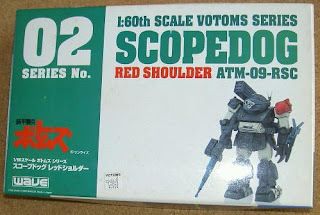 I haven't opened the packets yet but after looking at the sprues, I will have enough components to create both Scopedogs and Red shoulders. 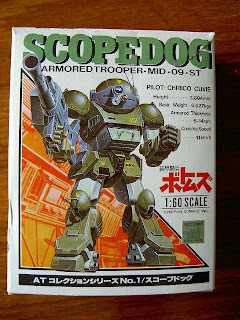 It is a future plan (probably next year...or even later) but I am going to be converting the kit to use ball joints and will be using the converted components to cast my own pieces. I won't be selling any and when I've finished, the kits will not be recognisable as plastic kits...I will be simplifying everything into as few parts as possible and they will be in resin. I feel that it is the only way that I can build the army of VOTOMs troops that I have always wanted to do. It will also be an excellent way to learn how to cast resin. On to other things and I have put in another order to Old Crow. Three more Glaive APCs will be winging their way towards me in a month or so and they will be the last vehicles needed to finish off the Urban infantry company. I would have waited for Salute to get them but Old Crow, won't be there...so I thought I'd get in and buy some now. I have nearly finished painting my Grymn Walker. I only have the base to go and it is done. I haven't painted the seated pilot yet...but the standing pilot is also painted except for the base so show and tell tomorrow should be worth the wait. I have gone for a slightly different Urban camouflage scheme for the walker but I think it will fit in fine with the rest of the army. Interesting times...and still no decal fitting! Mind you, if I am going to get distracted from my chosen tasks, I'd rather it was as a result of free Grymn Walkers than anything else!!! See you from the Mech command seat!